Based in Bangkok, Thai Airways International is a Star Alliance member flying to 78 destinations worldwide. While they do not currently fly to North America, Thai provides connections throughout Asia, to Oceania and Europe. Reward travel availability is very good. Thai Airways flies the A380, has taken delivery of 787s and has A350s on order as well. 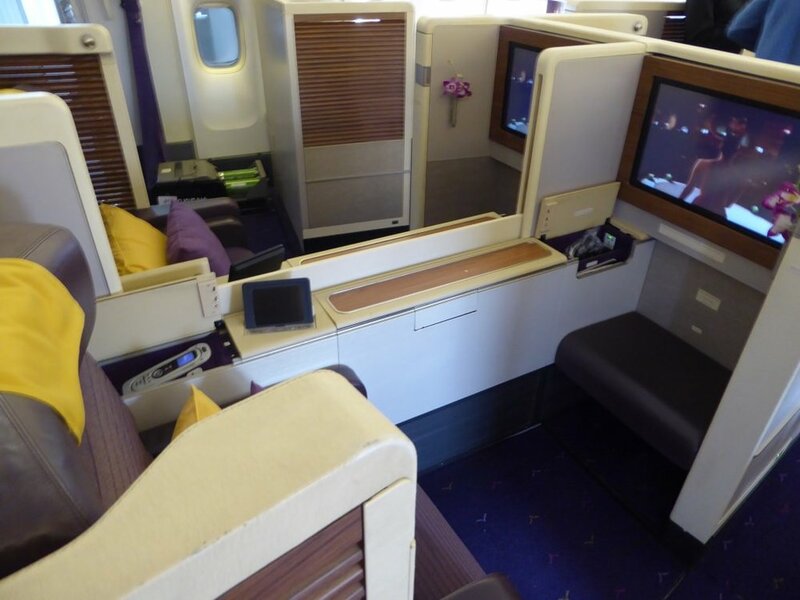 Royal First is installed on Thai's A380s along with their 747-400 aircraft. All other Thai aircraft are business class only. These A380 seats are 26 inches wide and have an lie-flat length of 83 inches. An extender can be raised for privacy in the center seats, otherwise there is only one seat against the windows. The A380 cabin has 12 first class seats and is readily available for Reward Flyers. The 747 first class compartment different. Slightly narrower at 21 inches wide but just a comfortable (and in Reward Flying's opinion more so). There are 9 suites in the lower deck nose of the 747. Airbus A380, new A350, select Boeing 747s and all 777-300ER aircraft have the new PriestmanGoode designed cabins featuring Stelia's Solstys seating. These seats are also used by China Southern, Emirates as well as Etihad among others. You can tell by a layout of 1x2x1 if the Royal Silk cabin has this seat installed. The seat gets highs ratings from premium travelers. Regional products have a 2x2x2 configuration except in the 777-300 where it's 2x3x2. These seats appear very similar to the seats found on United Business/First cabins so they are most likely BEA Diamonds. The new 787 aircraft have this style seat installed as do A330s, some 747s, 777-200s and non ER 777-300s. Thai Airways is known for its ground service in Bangkok. First Class passengers get transferred by buggy. But the main attraction is their lounges and in particular the spa. In concourse D the Royal Orchid Spa is where first class passengers can receive a complimentary 60 minutes massage and business class passengers receive a 30 minute neck and shoulder or foot massage. Skytrax named the the Worlds Best Airline Lounge Spa Facility in 2015. Have you flown on Thai? Share your experience with others in the comments section.